Jimmy Saied Wehba (September 29, 1934 – August 19, 2010) was an American professional wrestler and manager better known by his ring name Skandor Akbar, which translates as "Alexander the Great". Akbar led the villainous stable Devastation, Inc. in Bill Watts's Universal Wrestling Federation during the promotion's heyday in the 1980s, as well as other regional territories, including World Class Championship Wrestling and the Global Wrestling Federation. Akbar started out as a professional wrestler in 1963 as Jimmy Wehba. He changed his name to Skandor Akbar at the suggestion of Fritz Von Erich in 1966 in order to sound more Arabic. Akbar teamed with Danny Hodge and eventually turned on him, starting a feud. Akbar joined the World Wide Wrestling Federation (WWWF) for a brief run in the late 1970s and was managed by Freddie Blassie. Akbar also worked as a face in the Australian World Championship Wrestling territory for a season in the mid 1970s feuding mainly with The Great Mephisto. Akbar retired from active wrestling in 1977 and became a villainous manager in with the Texas area territory. 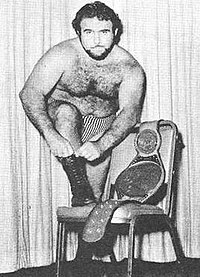 He called his stables "Akbars Army" in Mid-South Wrestling for Bill Watts before it became UWF and "Devastation, Inc." in World Class Championship Wrestling for Fritz Von Erich. But most famously in World Class Championship Wrestling, in 1991 the World Wrestling Council in Puerto Rico. Akbar smoked cigars at ringside, harassed the fans during his protégés' matches, and occasionally threw fireballs at unsuspecting opponents. In 1994, Akbar briefly managed Kevin Von Erich as a fan favorite in the Global Wrestling Federation. Eventually, though, he turned on Von Erich only weeks before Von Erich decided to retire for good. Akbar also managed Toni Adams for a short time in the GWF. After his semi-retirement, Akbar still made frequent appearances on the independent circuit, while also training wrestlers. He appeared on both the Heroes of World Class and Triumph and Tragedies of World Class retrospective documentaries, released in 2005 and 2007, respectively. From 2008 to 2010, he appeared as a manager in the Dallas-based Wrecking Ball Wrestling promotion. Often billed from Lebanon, Syria or Saudi Arabia, his father actually was from Lebanon, and his mother, Mary, had Arab roots as well, though she too was born in Texas. With two older sisters, he was the youngest of the family. On August 19, 2010 it was reported that Wehba had died from prostate cancer. Wehba was Catholic. ^ a b c Caldwell, James (2010-08-20). "Other News: Legendary wrestling manager Skandor Akbar dies at age 75". PWTorch.com. Retrieved 2010-08-20. ^ "CANOE -- SLAM! Sports - Wrestling - The celebrated career of the late Skandor Akbar". slam.canoe.ca. Retrieved 2014-01-26. ^ Pringle, Percy. "God only takes the best..."
^ Simnacher, Jim (2010-11-10). "Jimmy Saied Wehba, wrestler who ruled the ring as 'Skandor Akbar,' dies at 75". The Dallas Morning News. Retrieved 2015-05-18. ^ "Year End Awards". Wrecking Ball Wrestling. Archived from the original on 2013-09-28. Retrieved 2013-09-26. Steve Austin and Jim Ross (2003). The Stone Cold Truth. Pocket Books. ISBN 0-7434-7720-0. Championship wrestling from Florida: Skandor Akbar, a collection of flyers between Sept. 21 – Oct. 8, 1971. This page was last edited on 26 February 2019, at 03:16 (UTC).